AdapTree is developing a system to match spruce and lodgepole pine seedlings to the optimal growing environments within their current species ranges. Utilizing state-of-the-art genomics and climate-mapping technologies, the researchers study lodgepole pine and spruce trees to identify genes that are linked to tree characteristics required for successful growth in the changing climate. More information may be found at the AdapTree page. Researchers are using new genomic research technologies to identify proteins or gene products closely associated with natural disease resistance. Biologists, beekeepers and economists will also work together to design and evaluate these practices in multiple commercial beekeeping operations, with the ultimate goal of providing tools to beekeepers that will help to reverse the decline of the honey bee industry and decrease dependence on traditional chemical methods of control. More information on the Bee IPM project is available at the project page. Produced by g.e@UBC animation intern Katia Truong. 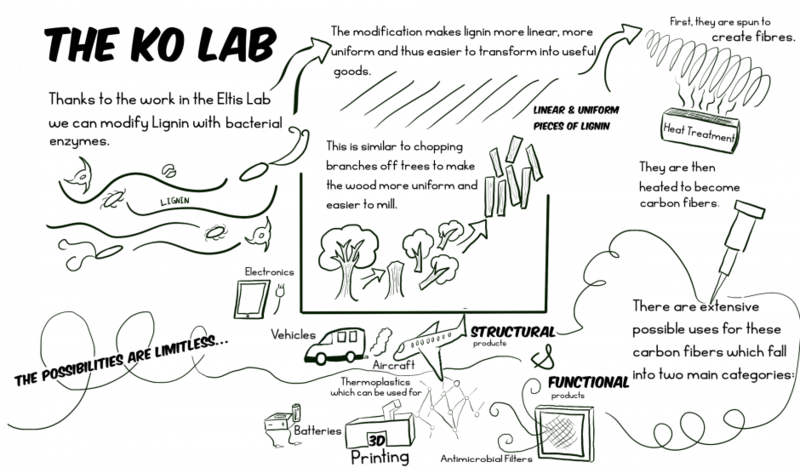 The Lignin project uses soil microorganisms to naturally degrade biomass to create new products from lignin. 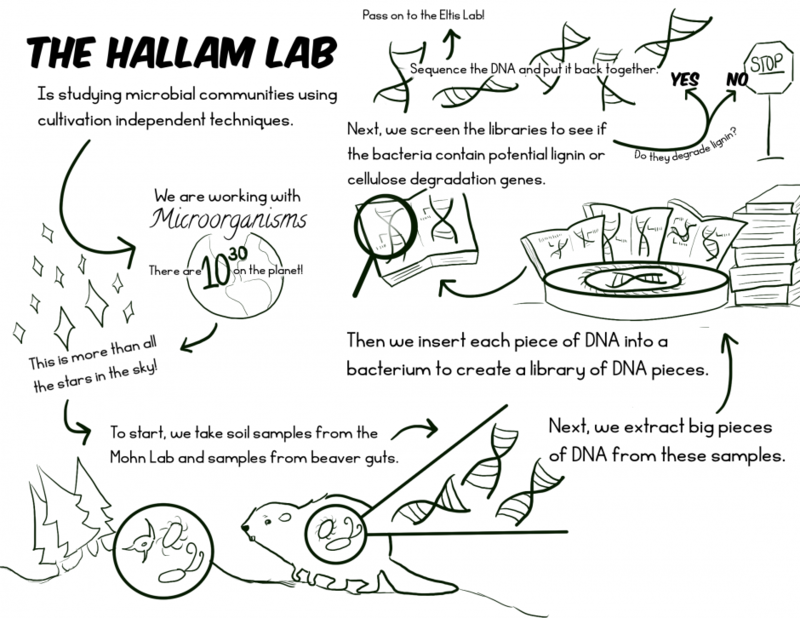 Click on the links below to find out how each lab contributes to the project. These Sketchnotes are developed by g.e@UBC intern Katie Verigin. 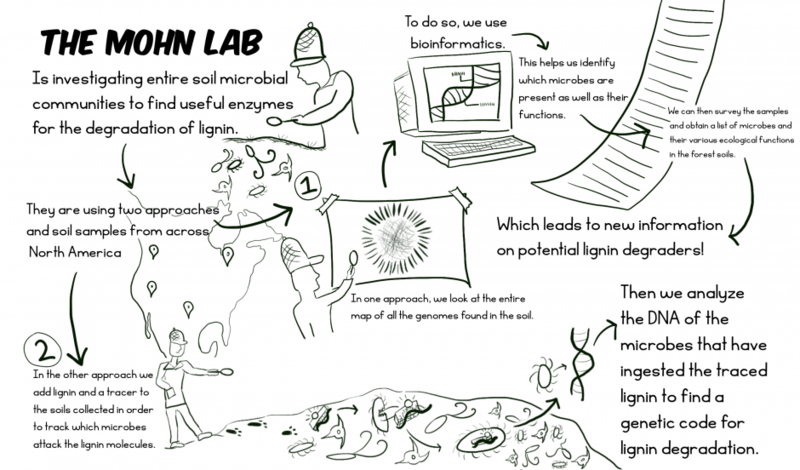 Lignin – Harnessing microbial diversity for sustainable use of forest biomass resources from UBC UILO on Vimeo. Canada’s natural, planted and urban forests are increasingly threatened by pests and pathogens. The TAIGA Forest Health project, which uses new genome sequencing tools to identify infectious agents and their origins, is critical to preventing damage to forests. The Watershed Metagenomics team is using genomics tools to track microbial pollution in our drinking water. 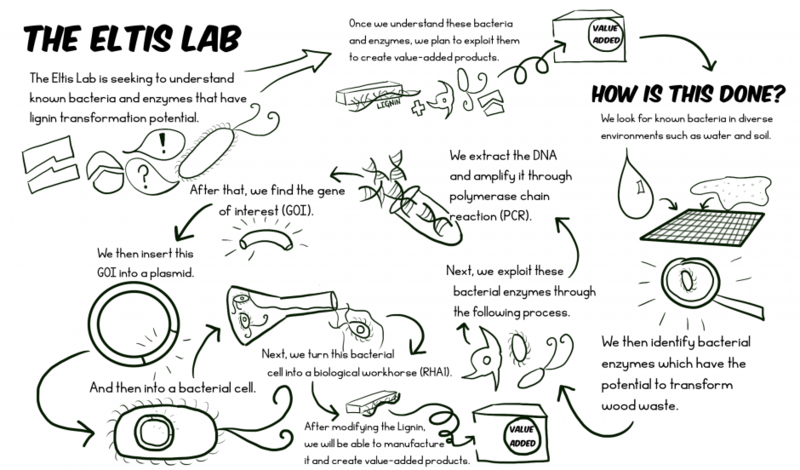 Learn more about the project at the Watershed Metagenomics page. Produced by g.e@UBC animation interns Katia Truong and Julia Suen. The Research: Planning for Impacts seminar, held in June 2012, outlined the value and process of strategic communications in knowledge mobilization. The session attracted approximately 60 attendees from our Research Partner projects and the wider UBC community. More information is available at the event page. Lean Launch Pad (LLP) is designed to engage you in moving potential products out of the lab and into the market through talking to customers, partners and competitors, and encountering the challenges and uncertainty of creating successful innovations. Find out more about at the LLP page. Filmed and produced by g.e@UBC video intern Julia Patey. Steven and one of his students, Cameron Strachan, co-founder and CEO of MetaMixis, participated in g.e@UBC’s Lean Launch Pad for Genomics sessions. Steven and Cameron are excellent examples of successful researchers addressing the commercial challenges of transferring their research from the ‘lab’ to the ‘field’, and thus benefitting Canada’s social and economic development. Read more about Steven Hallam here. Film produced by g.e@UBC interns Bahar Salehpour, Katie Verigin and Katia Truong. New technology in the wine industry brings new questions about where science and society interact. In collaboration with social scientists, this project will investigate public concerns regarding the use of genomics technologies in the production of wine and the general food industry. More information on the Grape and Wine Genomics can be found here. In our Mentor Profile series, we feature g.e@UBC LLP mentors. Mentors play a key role in guiding our cohorts throughout the entrepreneurial process. Read more about our mentors here. On May 21st, Dr. Samantha Evans, Director of Evaluation at Genome Canada, joined us for an open dialogue on demonstrating the impact of current and future Genome Canada research projects. More information is found on the event page. Click here to read more about Dr. Evans. The Policy Entrepreneurship program is a combination of speaker sessions and hands-on workshops that provide researchers with tools to enable them to develop strategies to address the policy and regulatory challenges involved in conducting research, securing funding , and mobilizing research outside of the lab. The following Sketchnotes, created by g.e@UBC intern Katie Verigin, are a summary of each event. Visit the Policy Entrepreneurship program page for more information. This interactive Lunch & Learn was an introduction to techniques to map a relationship network, to visually communicate the social and economic impact of research, and to frame researchers’ work in a way that resonates with the public and build closer relationships with funders. Visit the event page for more information. genomics.entrepreneurship@UBC and TerreWEB joined forces to organize a year-end showcase to celebrate our speakers’ passion for their research in this Powered by Pecha Kucha night. More information available here. In January 2015, the GREAT program hosted its second showcase event to celebrate our passion for entrepreneurship under the tail of a blue whale at the Beaty Biodiversity Museum. Find out more about the event here.